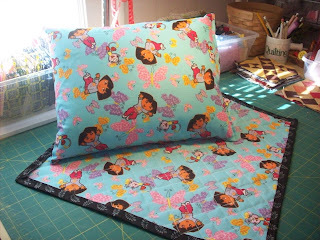 Now that I have the picture thing working I just need to figure out how to read posts from other quilters. Wish me luck! Have a great weekend! Whew! My day got off to a shaky start, overslept,forgot my phone, foggy,rainy,yucky,but it did get better! Beginning Monday, I start a quilt class! Mom's going too! The girl is going to teach us stack and whack! This method produces killidescope (sp?) blocks for a quilt. I've never done it but I've seen them and they are beautiful. 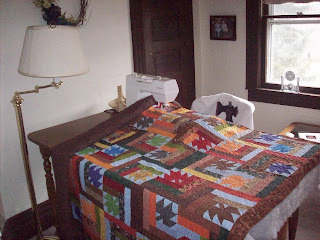 I love to quilt and I love to learn something new. But, I must confess,I'm doing this more for my mom than me. Since my dad died, mom is kinda lost and needs some "friends" her age to get together with. She loves to sew and use to quilt too! I'm excited about the class but, really excited that my mom is going to get out and meet some new people and try something new. And quilters are the best kind of friends, right? I'm really looking forward to it. Mom and I are going to my friends shop, (Jo Ann's, she makes be buy fabric) to get her a rotary cutter,cutting mat,a ruler and some fabric for the class. That will get her motivated! I'll keep you informed. Hope you all had a productive Wednesday and didn't oversleep! P.S. I forgot the best part, the class is FREE!!!!! WHOOOHOOOO! I can afford that! I'm still working on piecing a quilt for my sister but I havn't touched my falling leaves quilt today. Wow! your cookies look wonderful and NO CALORIES.....whooooohooooooo! Christine, wouldn't it be wonderful if we could ALL have a girls night in??? A bus tour???? A shop hop???? Oh my! I sound like a have a bit of quilter's cabin fever? Happy Weekend! Having my mom,my sister,my daughter and my aunt over for girls night in this evening. We use to do girls night out on Thursday but got tired of eating out so....... tonight we're having homemade bbq and fries! (yum!) Mom's bringing a chocolate pie. hmmmmmm may do dessert first. Trying to get mom back on the quilting wagon. Says she's got too many projects going. (Who doesn't?) Anyway, I've always heard the busyest people can always do one more thing. We'll see. Perhaps a trip to JoAnn's will inspire her! I can always go there! Thank you and welcome to the girls from apq that stopped by to see me and let me know I'm once again in quilt land! :) Hubby and I spent the afternoon together shopping for our grand daughter. We took her a Dora baloon and a monkey from hallmark that waves his arms and makes monkey sounds. She LOVED it. She said oh dora, and gave the baloon a big kiss. It was three dementional and was as big as she was. It was a hoot! Still snowing here....suppose to see sunshine wed-fri......we'll see!